Fall colors are the perfect complement to the pieced Leaf Basket block used to construct this seasonal table runner. 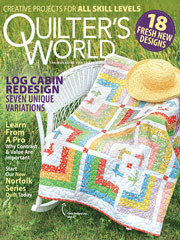 This e-pattern was originally published in the October 2004 issue of Quilter's World magazine. Size: 37" x 22". Block Size: 7 1/2" x 7 1/2".